The Ministry of Culture (MOC) is responsible for international cultural relations, copyright, cultural heritage, museums, book publications and literacy programmes, festivals, visual arts, film, performing arts, academic education in the arts. 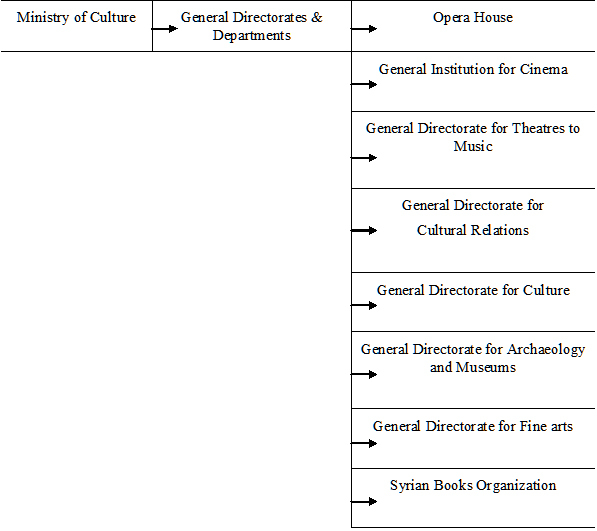 Directorate of Museum Affairs: Responsible for the management and development of all Syrian museums, in addition to supervising any foreign exhibition of Syrian artifacts. Directorate of Excavations and Archaeological Studies: Responsible for the managing, organizing and supervising excavation works inside Syria and cataloging any findings. the Ministry of Local Administration organizes the work of governorates and municipalities (2). Each ministry has a statistics and planning directorate, which reports to the minister in question, but the SPC are involved in defining policies. Each ministry submit its plan for approval by the SPC, together with the investment (planning) budget and the running budget. ‘the annual plans must be approved by the Council of Ministers; the budget is confirmed after it has been ratified by Parliament. The cooperation between ministries or governmental bodies in the cultural field is limited to signing short-term memoranda for the implementation of projects or activities. To implement such interministerial agreements, a joint committee is formed under the supervision of the legal departments of the ministries in question, and after the official signature of this partnership, another joint committee is assigned to coordinate the project. As a result of this poor consultation, proposed interministerial projects overlap and there is mutual interference in projects adopted by different ministries. For example, both the Ministry of Culture and the Ministry of Tourism are responsible for the coordination of the relations between the cultural and tourist sectors. The Ministry of Local Administration supervises the work of governorates and municipal councils. Each governorate has 2 administrative bodies: an executive office for cultural affairs, celebrations and festivals, which is a department within the municipalities, and a Directorate of Culture, which represents the Ministry of Culture. Cultural centres therefore have to deal with a double governance. On an administrative and financial level they are affiliated to the Ministry of Local Administration/ governorates (municipalities) and on a programming level to the Ministry of Culture. 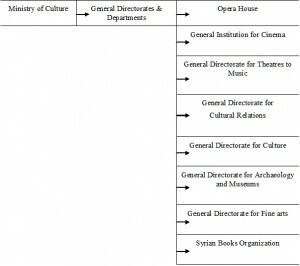 The Directorates of Culture are located in all 14 Syrian governorates. The ministerial rules and the rules of their administrative representatives overlap which makes it difficult for the centres to operate efficiently. Under a joint initiative launched by the EU and the Syrian government, work began in 2005 on preparing the first experimental stage of the MAM (Municipal Administration Modernization) project in 6 cities. The MAM Project aims to decentralize decision-making, giving local authorities greater control over their affairs, and introducing administrative and financial changes. Local communities are slowly becoming partners in the development of programmes and research, although communication channels between the cultural sector and local communities are still in their infancy. In recent years, the Ministry of Culture has extended the geographical range of its activities to the Northern region of Syria. Until then cultural activities were concentrated in the capital and a few large cities. The main legislation on the organization of the SPC is Decree No 86 (1968) and its amendments by virtue of Decree N’ 5 (2004). The Ministry was established on the basis of the Local Administration Law (1970). [♥] From: Syria by Reem Al Khatib and Rana Yazaji published in ‘Cultural Policies in Algeria, Egypt, Jordan, Lebanon, Morocco, Palestine, Syria and Tunisia. An introduction’, Cultural Resource/European Cultural Foundation, Bookmanstudies, 2010, 177-181.